Filming for The Exorcist took nearly a year to finish. At the end of this, with 9 deaths and 1 unprovoked fire under it's belt, It became the most shocking and horrific film ever produced. A film based upon it's own screenwriters novel, sharing not only it's name but the ability to provoke physical sickness. 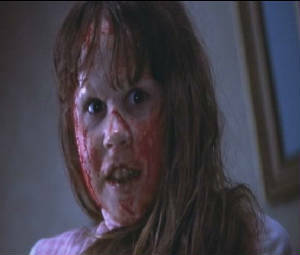 In this movie Linda plays the unsuspecting Regan MacNeil, who becomes possessed by a demon (who was later descovered to have a bloody stupid name, therefore he shall be referred to as 'Captain Howdy') and because of this she discovers; she is double jointed, can projectile vomit split-pea soup and can take the "funky chicken" to extremes. but joking aside, it is a brilliant movie. Click to download the original "spider" scene.